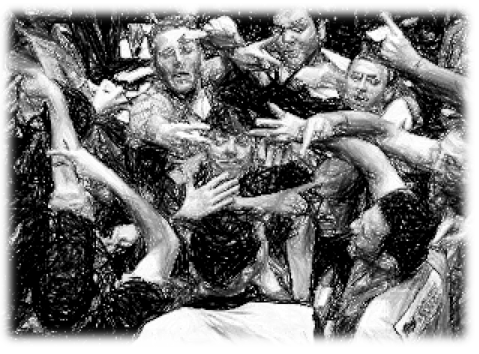 Violence erupted in the silver market last night in Asian trading. And while the trading volume was thin due to many Asian markets being closed for their respective holidays - the velocity and magnitude of the initial decline was staggering. Within the first eleven minutes of trade, the market was down over 12%. Who knows where it will be by the time we open tomorrow morning, but suffice to say the silver market is getting downright Sopranoesque at the top. This should come as no surprise to anyone following a parabolic move. The angle of incidence equals the angle of reflection once you hit exhaustion. 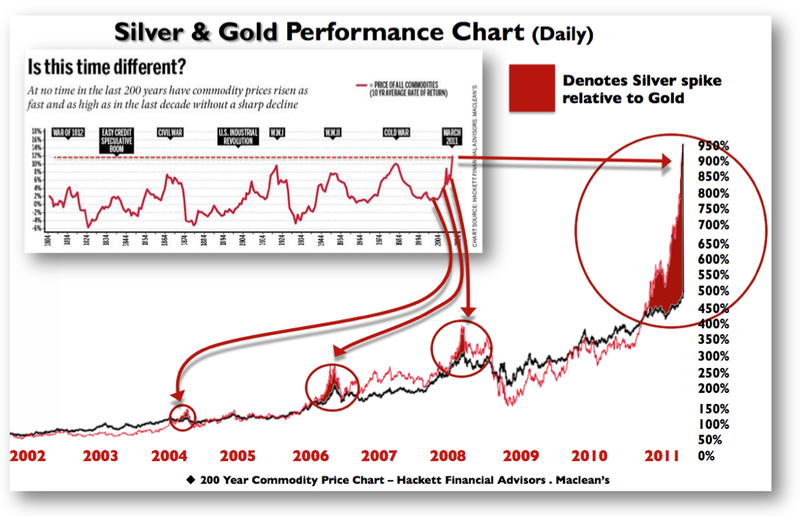 As a critic of this sector I can reason with greater confidence that the parabolic move in silver is coming to an end. And while there is a possibility that the market will make another run at the previous highs - silver's fate has very likely been sealed. A market that trades with this much volatility (four standard deviations above the average price move after a 60% gain in three months) indicates it is in its death throes of upside momentum. Today, everyone believes the inverse relationship to be true. That the financial system is broken, that the Fed has lost control and that Islamic Jihadists or a Middle Eastern state(s) will bring us to our knees. While there is some truthiness in shades of that - it's more hyperbole than reality. It was the confluence of the Tech Bubble bursting in 2000, the events of 9/11 and a commodity sector that was overdue for outperformance - that gave birth to this bubble. As with every bubble - it starts with a legitimate thesis for outperformance - and then runs away with emotion. It is only after we reach the dizzying heights of the sun that we realize the danger we so confidently embraced. If there was ever a more fitting bookend to the bubble that is silver and gold - we received it tonight. The poster-face of the fear trade has been killed. 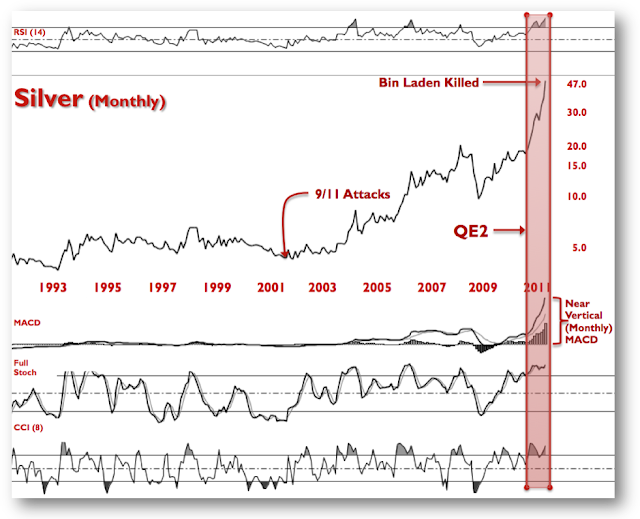 Certainly the bull market in precious metals was not predicated solely on the War on Terrorism or Osama Bin Laden for that part - that's ridiculous logic. However, every bull market needs a catalyst to prick the runaway momentum that completes the final parabolic move. Once the dust settles, Bin Laden's death will contribute to that psychological sea-change that was already gaining steam inherently with the conclusion of QE2. It could be the perfect storm the charts were alluding to. 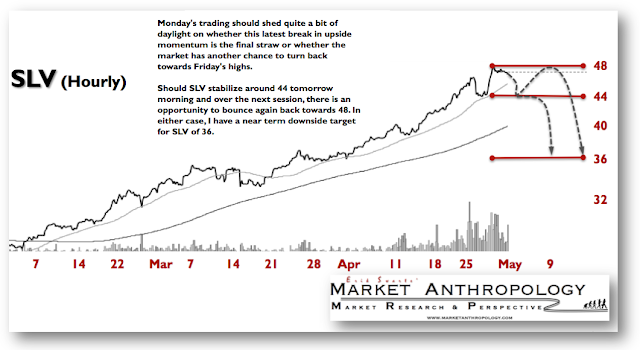 Monday's trading should shed quite a bit of daylight on whether this latest break in upside momentum is the final straw or whether the market has another chance to turn back towards Friday's highs. Should the silver ETF stabilize around 44 tomorrow morning and over the next session, there is an opportunity to bounce again back towards 48. In either case, I have a near term downside target for SLV of 36. I just joined Twitter, you can find me here. All my trades are disclosed in real-time through Twitter.